On a hill overlooking the bay, 17th-century Fort Napoléon, with its historical museum and Exotic Garden, is one of the island’s main tourist attractions. Another highlight, Morne du Chameau is the highest point on the island and takes around two hours to ascend from Terre-de-Haut village. Across the bay, Ilet à Cabrit is a small island where the ruins of 19th-century Fort Joséphine still stand. 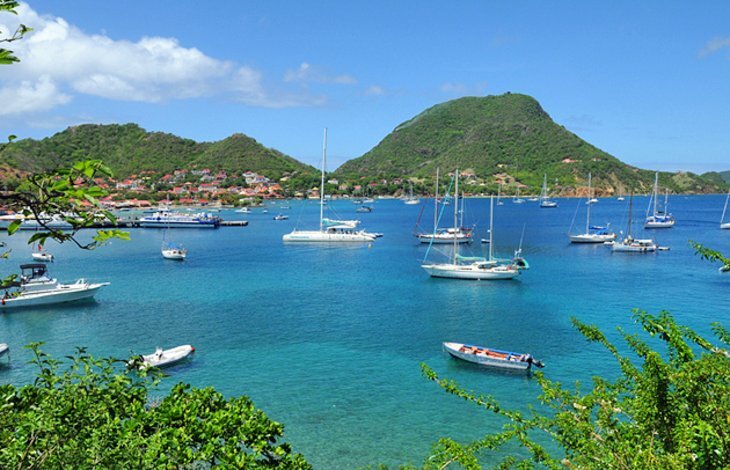 Terre-de-Bas is the western island of Les Saintes and features small fishing villages, swimming beaches, and hiking trails. Two hours is sufficient to cross the island, which is considered one of the most natural and wild in the Guadeloupe archipelago. Grande Anse on Terre-de-Bas features a small 17th-century church, a pretty bay and beach with huts for swimming and snorkeling, and a hiking path to the promontory of 273-meter Grande Montagne. Gros-Cap is the main village of Terre-de-Bas with a ferry landing, hotel, restaurant, and the starting points of roads and hiking trails.